Online poker has once again become a target in Congressional circles, as the Restoration of America’s Wire Act (RAWA) was reintroduced to the House of Representatives on Wednesday. As it was last year, the House version of RAWA was introduced by Representative Jason Chaffetz (R-Utah), and would effectively ban most forms of online gambling throughout the United States, including Internet poker. The bill, which has been backed by Las Vegas Sands CEO and chairman Sheldon Adelson, would reverse a 2011 decision from the Department of Justice which clarified the Wire Act of 1961. While that law had traditionally been read to ban all forms of remote gambling, the new reading found that it actually applied only to sports betting. The result was that states were now free to consider regulating online poker and casino games. Nevada was the first to do so, opening online poker sites, while New Jersey and Delaware went even further, allowing both poker and casino games to be played over the Internet within their borders. If RAWA were to pass, it would roll back the law and make it illegal for those states to continue offering online gambling. It would also impact online lottery sales, though it would not stop online fantasy sports games or horse racing wagers, which are protected by carve outs. Chaffetz has said that he is “very optimistic” that his bill can pass, which may sound concerning to online poker players. However, most analysts give the legislation a very slim chance of becoming law. The issue simply isn’t high profile enough to get a large number of legislators behind it, and GOP leaders may shy away from the bill, as there is considerable debate even within their own party as to whether online gambling should be a state issue rather than a federal one. One way in which the bill could slightly improve its chances would be to provide an exemption for online poker, which is seen by many as more palatable than casino games thanks to its skill component. That’s something that has been championed by Senator Harry Reid (D-Nevada), the former Majority Leader who said that he’d fight for such a carve out if RAWA ever picked up momentum in Congress. But while that might be a possibility, Chaffetz made it clear that he’s not looking to support a weakened version of RAWA. 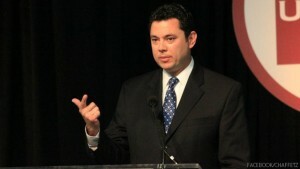 Defenders of online gambling were quick to react to Chaffetz’s reintroduction of RAWA, saying that the introduction of online poker and other games in three states have proved that Internet gaming can be safe and secure when well-regulated, and that banning such regulations will simply push the games back onto a black market with few consumer protections. “We know that when policymakers examine the facts they will conclude that an online gaming ban will not only drive an existing black market further into the shadows, but will put consumers and children at even greater risk,” said Allison Siciliano, spokeswoman for the Coalition for Consumer and Online Protection.